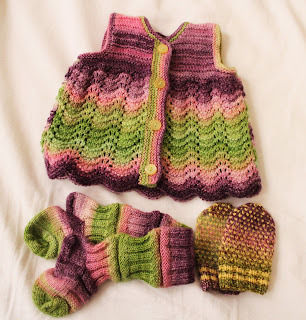 This is what I knitted from the yarn I spun in January. I love the "Old Shell" lace patterns of Shetland. It's designed for colored lace knitting, and works very well with the handpainted look of my yarn. The socks are called "Train Socks". I have written about them here. In the mittens I also used a yellow commercial yarn.